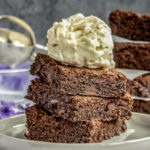 Chewy, dense, fudgy and a little gooey if you decide to serve them warm, these are my go to crowd pleasing brownies, no one need know that they contain no dairy, eggs or gluten! They’re chocolatey chunks of deliciousness that are sure to go down a treat whatever your dietary preferences. Line a 9 * 9 in tin with baking paper and lightly grease with spray oil. Mix together flaxseed and water and set to one side for 10 minutes. Place soft brown sugar or coconut sugar into a high speed blender or Nutribullet and blitz to a powder. 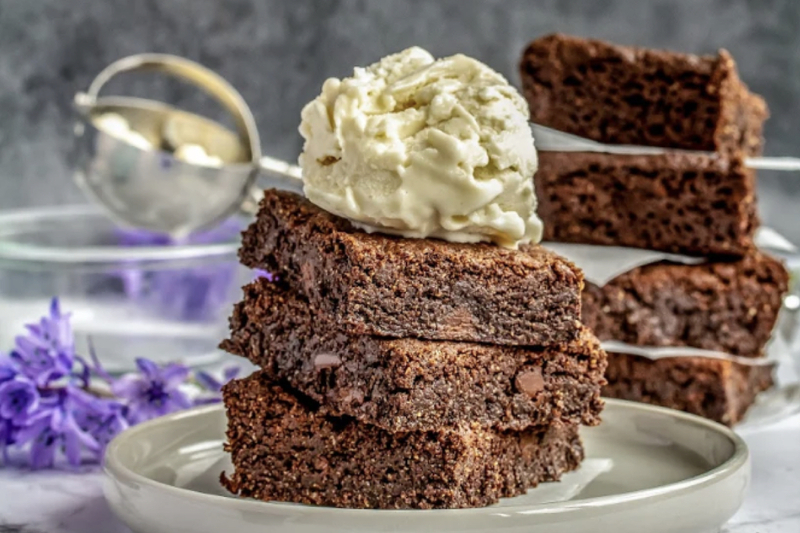 Melt 120g chocolate and coconut oil together in bowl or jug that is heat safe over a pot of boiling water or alternatively in a pyrex jug in the microwave; 30 seconds at time and stir after each round until melted. Stir in powdered sugar and vanilla extract. Stir in flax “egg” mixture. Add in dry ingredients and use a whisk to combine to ensure there are no clumps. Mix until you have a smooth batter. Fold in remaining chocolate chunks or chips. Spread batter, which will be quite thick, into the prepared tin. Ensure it is evenly spread before baking for 25 – 30 minutes. Check after 20 minutes and cover with tin foil if necessary to prevent burning. Allow to cool FULLY before slicing, ideally overnight! Michelle Hunt is the face behind Peachy Palate, a website which is a hub for all creative recipes, hoping to inspire people to think outside the box, eating whole foods that truly nourish. Michelle shares sweet and savoury recipes to help ensure no one need feel deprived regardless of their dietary restrictions or preferences!